Margaret Ellen "Johnie" Johnson and Hubert "Dale" Gano were both born in 1916. Each grew up in a small town in Illinoisshe in Keywanee, he in Mattoon. In 1936, at the height of the Great Depression, they met at a University of Illinois dance. Johnie graduated in 1938 while Dale  unable to afford his college tuition  left and enlisted in the U.S. Navy. After completing training school, the Navy sent Dale to Pearl Harbor, Hawaii, for his first duty station. 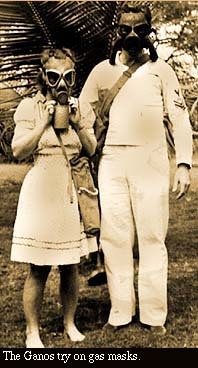 In July 1941, Dale made first-class petty officer and asked Johnie  "the love of my life," as he describes her  to marry him. By December the newlyweds had settled into a house in Pearl City. On Sunday morning December 7, Johnie was just waking Dale for church when bombs began to fall. Dressing quickly, the couple ran outside to see what the commotion was. Johnie and Dale did not make it to church that December day. Instead, as Johnie says, they had "front row seats for the Japanese sneak attack at Pearl Harbor." After World War II ended, Dale remained in the Navy. His 30-year career took the couple and (eventually) their four children to many places including Virginia, Illinois, California, Hawaii, and Italy. They finally settled in Pensacola, Florida, where Dale retired as a Commander. At 80-years-old, after a full career in aviation mechanics and technical training, Dale is a flight instructor and ground school trainer in retirement. He enjoys flying, and spends many hours in his garage building small airplanes. Throughout her many years of homemaking and child-rearing, Johnie has developed her artistic talent through needlework. She has shared her love of the craft with many pupils. Now 81, Johnie still enjoys a daily swim and occasional bike ride. Find out more about Johnie and Dale, and their experiences at Pearl Harbor by reading an interview with them.